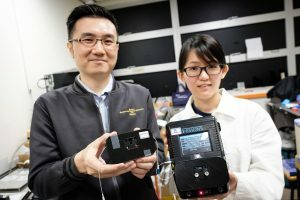 NTU scientists have developed a new portable device that traces heavy metals in drinking water within a span of five minutes. The device is said to mimic an organic substance within the circulating human bloodstream known as a chelating agent, which detects and binds to heavy metal ions. After binding, the agent prevents the heavy metal ions from interacting with other molecules and enzymes in the body, and marks it for excretion from the body. NTU Associate Professor Yong Ken-Tye and Professor Tjin Swee Chuan followed a similar process to develop their new device. Combining a chelating agent with an optical measurement system ensured that the device generates test results quickly without needing to bring samples back. This makes the device ideal for on-site water testing. It can also be fused with domestic appliances such as water filtration systems. Drinking water quality is typically monitored via laboratory tests as heavy metals cannot be identified by color, taste, or odor, unless present at high levels. These lab tests, while being highly accurate, take at least a day to complete. The NTU invention works in the field and requires just a few drops of a water sample into a disposable sensor cartridge to detect heavy metals at parts-per-billion precision. This level of sensitivity is in line with the safety limit requirements in Singapore that falls within the World Health Organisation’s (WHO) standards. For instance, the device can detect lead levels of 5 parts per billion, which is lower than the 10 parts per billion limit stipulated by the Environmental Public Health Act in Singapore. According to the scientists, the sensitivity of the sensor is also not limited by exposure to air, and remains effective up to a temperature of 40°C. Ken-Tye says that the device can detect up to 24 types of metal contaminants, which is double the capacity of other commercially available water sensors. The NTU team has already filed two patents for their invention and has successfully incorporated a spin-off ‘Waterply’ to market their device. According to the scientists, Waterply is presently collaborating with a Chinese state-owned company to develop next-gen water sensors that tackle water pollution.